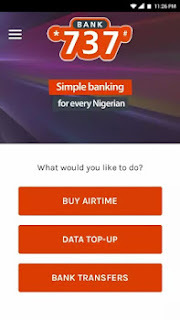 Guaranty Trust Bank (GTB) has Introduced yet another app, and this app let's you carry out transactions easily GTB called the app "Bank 737" app. This bank 737 app works like the bank's offline *737# USSD short code but the difference is this one works with internet connection while the short code version works offline without internet. Another difference is that the USSD short code can be used in any type of phone but the app version is currently available on Android devices only for now. In other words, the Bank 737 app is the fastest way to buy airtime and transfer funds from your mobile phone. According to GTBank, the app is simple and secured! Your card details are encrypted. Just add your debit card and you’re good to go. » Transfer funds to any bank within Nigeria. HOW TO USE THE BANK 737 APP? » After registration, just login with your phone number and 737 PIN. Note, accepted cards are MasterCard and VISA cards only.